If, like us, you groan when you read that another zombie movie with a [Something] of the Dead title, particularly given the number of half-arsed genre movies that have had "...of the Dead" title changes for their UK DVD release. Now comes Juan of the Dead (Juan de los Muertos), which sounds a little like a Spanish take on Shaun of the Dead, and I wasn't that crazy about that. But hang on a minute, Juan is clearly no cheap zombie knock-off made by a bunch of College kids with their Dad's camcorder, nor is it a belated attempt to cash in on Shaun's mysterious popularity. Having been supplied a rather flimsy synopsis with the press release, one that gives no real idea of the film's attractively offbeat approach to a well worn genre, so I'll borrow the one from the film's official web site. Juan is 40 years old, most of which he spent in Cuba doing absolutely nothing. It's his way of life, and he's prepared to defend it at any cost, along with his pal Lázaro, as lazy as Juan but twice as dumb. Juan's only emotional tie is his daughter, Camila, a beautiful young girl that doesn't want anything to do with her father because the only thing he's good at is getting into trouble. Suddenly strange things start to happen – people turn violent and attack one another. Juan is first convinced it's just another stage of the Revolution. Official media refers to the attacks as isolated incidents provoked by Cuban dissidents paid by the US government. Little by little Juan and his friends begin to realize that the attackers are not normal human beings and that killing them is a somewhat difficult task. They're not vampires, they're not possesed, but they're definitely not dissidents; a simple bite turns the victim into other violent killing machine and the only way to beat them is to destroy their brains. Juan decides that the best way of facing the situation is making some money out of it. "Juan of the Dead, we kill your beloved ones" becomes his slogan. Lázaro, along with his son Vladi, and Camila (who had no other choice but joining her father after he rescued her from grandma´s killing desires) are Juan's army, and their mission is to help people get rid of the infected ones around... at a reasonable price. Cuba's first ever zombie film has proved a festival hit and appears to be scoring with the critical fraternity too. Genre specialists Starburst said of it: "Juan of the Dead is something of a minor miracle. Forget the touchstone title referencing Edgar Wright's breakthrough movie and enjoy one of the most inventive, funny and thrilling zombie films made in the last ten years. Do not let this one pass you by." Sounds great! 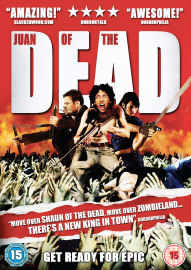 Juan of the Dead will be released on UK DVD on 4th June 2012 by Metrodome Distribution at the RRP of £15.99.